The dice blog provides an easy way to stay updated on new content at all-about-dice.com. To subscribe, just click on "that orange button" you see on any page. Learn how to play dice with instructions for popular games and free score sheets to download. Read up on the history of dice. Discover new games along with cool dice themed products like art work, clothing and more. Blog entries with the words "Dice News" in the title discuss new games or events. Dice clothes and accessories showcase cool designs on shirts, ties, hats and belt buckles. Find your favorite here! Continue reading "Dice Clothes and Accessories: Shirts, Ties, Hats, Belt Buckles and More"
Whether you see it on a canvas, a bicep, a photo or a computer screen, dice art will capture your attention. Continue reading "Dice Art: Tattoos, Pictures and More"
Enjoy a fun, challenging dice puzzle to keep your brain in tip top shape. Continue reading "Try a Dice Puzzle for a Mental Work Out"
Find a wealth of great dice games for kids of all ages. Continue reading "Great Dice Games for Kids"
From the welcome mat to the lamp shade, find the dice decor just right for you. Continue reading "Dice Decor for Home and Office"
The best online collection of flaming dice products anywhere. Period. 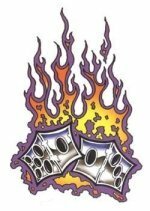 Continue reading "All About Flaming Dice"
Your free resource for dice tattoos with photos, articles and general tattoo tips to help you get inked. 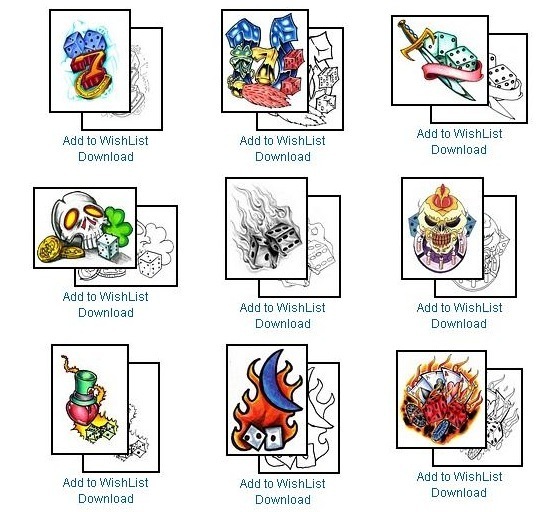 Continue reading "All About Dice: Dice Tattoos"
Bunco mania! Learn about bunco supplies, gifts and ideas that you need to throw a great bunco party. Continue reading "All About Bunco Supplies"
The best assortment of dice jewelry is only a click away. Continue reading "Dice Jewelry - Earrings, Necklaces, Cufflinks and More"
Got dice? If you want to learn how to play dice, find game instructions and download free score sheets, please stop on by! Continue reading "How to Play Dice Games"
Your top source of information on the popular bunco dice game. Continue reading "The Bunco Dice Game"
Oh, Farkle! No that's not a curse word, but you'll say that it if you fail to score in this addictive, fun, and challenging Farkle Dice Game. Continue reading "Farkle Dice Game"
Good pictures of dice capture their essence the best, so please enjoy this terrific collection of dice photos. Continue reading "Pictures of Dice"
The best online collection of information on where to buy dice and dice-themed products. Continue reading "Buy Dice and Dice Themed Products"
Find your new favorite rpg dice game among these easy to learn and fun role playing games. Continue reading "RPG Dice Games"
With foreplay dice, you're guaranteed to get lucky. Continue reading "Foreplay Dice: Fun For Consenting Adults"
All about fun commercial dice games that include boards, cards, marbles and more. Continue reading "Dice Games with Boards, Cards, Tiles and More"
Find your ideal dice costume and accessories right here. Continue reading "Dice Costume, Hats, Glasses and Beads"
Dice card games like Munchkin, Wildlife Rescue, Scary Tales and Knights deliver big fun. Continue reading "Fun Dice Card Games"
Each dice board game discussed features custom dice or creative uses for dice. 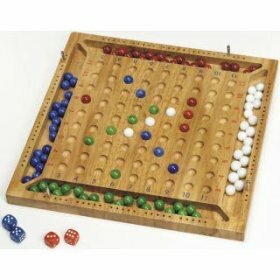 Continue reading "Dice Board Game Fun"
Discover how chess dice puts a fun twist on two classic games. Continue reading "All About Chess Dice"
Besides their obvious size advantage, dice are also easy on the budget, come in lots of different colors, shapes and sizes. Dice have fascinated people for centuries, so you're guaranteed to add an element of cool to someone's stocking. Continue reading "Psst....Dice Make Great Stocking Stuffers...I'm Just Sayin'"
This game has been around so long, that the original gamers have kids who have kids. Time to introduce the kiddos to a great game that doesn't require a gaming console. The Dungeons & Dragons Essentials "Red Box" Set will give them everything that they need to learn and enjoy this timeless game. Continue reading "50 Coolest Sports Bar Games"
"The Ultimate Game of Deceit", the rules of Diception sounds like a family friendly take on the game Liars Dice. A few rules' twists, such as the "second chance cube", create a memorable game for families to enjoy. Continue reading "New Dice Game: Diception"
Can dice help a person learn how to play the piano? Absolutely! Click the link for details on using dice to help students learn the piano. Continue reading "Fun Piano Game with Dice"
Dice and sports go hand in hand, which is why you'll find soccer dice games, football, baseball, bowling and even auto-racing. Well, now there's basketball too! Click the link below read John DeJong's article with detailed instructions on the game. Continue reading "Pro Basketball Dice Game - Free Instructions"
I came across this attractive d20 shaped dice bowl on artfire.com. Fill it up with dice or other goodies and you'll have a conversation piece in your home. It would make a great gift for a gamer too. Continue reading "Beveled Glass Dice Bowl"
Continue reading "Lucky Dice Coffee Mug"
Left Center Right - Turbo Charged Edition! New rules add to the fun in the popular Left Center Right (LCR) dice game. Check out the turbo charged edition! Continue reading "Left Center Right - Turbo Charged Edition!" Say what? A crossword numbers game? Yes, you read that right. In Sumoku, you roll a die to get a "key" number. Then, your goal is to arrange your tiles, crossword puzzle style, so the rows and columns equal a multiple of the key number. This game will show you who really knows their numbers! Continue reading "Sumoku - Crossword Style Numbers Game"
Tricia Smith posted this fun game on her blog, preparednotscared. Looks like spooky fun for all, just in time for Halloween! Continue reading "Spooky Eyes - A Halloween Dice Game"
Just in time for everyone's spooky holiday, Monster Dice are being sold over at the RPG Shop. Etched with creepy (yet cool) faces, these dice are definitely unique and fun to look at. You can even paint them any color you wish, so channel your inner Picasso and get creative! Astrology you can roll....ask a question roll the dice and divine your answer. Great for those interested in Astrology. Trying to figure out how to do good in the world? Too busy to read a self-help book? Well, the answer is simple. Roll some "Dice for Change" for tips on doing good deeds. Click the link below to read all about it. Continue reading "Dice News: Be a Better Person by Rolling Dice"
The next time you roll the dice, you can do so with a unique, handcrafted wooden dice cup. Ebay always offers some fun dice products, which is wear I found this one. The cup is crafted from a maple branch (fallen, not chopped) and its exterior sealed with Polyeurathane to protect it. Continue reading "Unique Dice Cup"
The dreaded color red is not your friend when you play Toss Up Dice. Continue reading "Toss Up Dice"
If you've got a few minutes (and you must, you're reading my blog), take this fun, free quiz by clicking the link below. The quiz name: What Type of Polyhedral Die Am I? Reading the questions is half the fun and in the end you'll discover your true dice self. Check out the helpful review using the link below. You can find a link to the IronDie web site on my "Buy Dice" page. Continue reading "Dice News: Great Review of IronDie Game"
Talk about custom dice! I just visited a terrific web site where you can create a 3D design and have it transformed into dice. Sound too technical? Well, I'm not going to try to explain it but their site can. Of course, you can also browse their gallery of unique 3D designs created by other users. You can order dice from one of the designs too. The link below will take you to the custom dice gallery. It is worth a look, so click and enjoy! Continue reading "Design Your Own Custom Dice"
Electronic dice, games and components deliver dice fun. Continue reading "All About Electronic Dice"
Make music in style with a set of 3 wood percussion instruments shaped like dice. Shake them to the beat and have fun making music. Continue reading "Dice Shakers - Percussion Instruments with Style"
If I'm traveling with friends or family, I want a game that appeals to adults and kids. A game that won't end because someone lost a piece. In short, a game made to travel! What is that game? Word Rally! Shake the container and then see how many words you can find on the dice in a limited time. All the dice have letters on them (obviously) and are contained inside the shaker. Planes, trains or automobiles, you can play it anywhere. Enjoy! Continue reading "A Dice Game Ideal for Travel"
The dice game 'Dice Diving' for the iPhone combines several familiar scoring techniques to create a fun, original game. For a game review of Dice Diving, click the link below. Continue reading "A Dice Game for the iPhone"
RPG Shop Has a Sale! I thought I'd share the good news: There's a nice sale on dice, games and accessories going on at RPGShop web site right now. Use the link below to view their clearance section for great prices on Pirate dice. From there, you can click on the dice section to view products and sale prices. You say "dice game" and most people will say "Yahtzee" or "craps"...which tells who's likely to jump on a plane to Vegas for a weekend. Yahtzee has been around for years and for good reason: It is lots of fun! There's variations of the original game, but for many, the original is still the best. Now you can pick up a version of Yahtzee based on your favorite characters, sports team or TV show. Check back again. I'll post another blog entry when I come across some new ones too. Happy Gaming! By the way, if you'd just like the good old fashioned original...click the link below. Continue reading "Choose Your Yahtzee"
I've always enjoyed playing the Texas Hold 'Em poker game with my family. 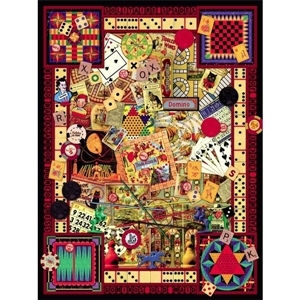 Its a fun card game that involves luck, strategy and skill. Now there's a dice version too! With a nifty see-through cup, you can check your 3 dice and combine them with the 3 community dice to make a hand. Is your hand good enough to win or are you prepared to bluff your way to victory? Continue reading "Peek Poker - A Texas Hold 'Em Dice Game"
Here's a great review of this game on the blog Teachnologist. The author describes how he modifies the Zombie Dice game rules to play it with his 6 year old son. Continue reading "Zombie Dice Review"
I love dice, which is why I created this site. Still, I feel compelled to share with you whenever I happen upon another game that impresses me. Here's a new twist on the classic chess board: Illuminated (and wireless) Chess Pieces. The pieces will glow red or blue when placed on the chess board. When removed from the chess board, they cease to light up. No wires or batteries are used in the chess pieces. They are made of glass and energized by magnets in the chess board. The board itself runs on batteries or with an AC Adapter. Click the link below and check it out! Continue reading "Dice News: Too Cool, I Had to Share it With You"